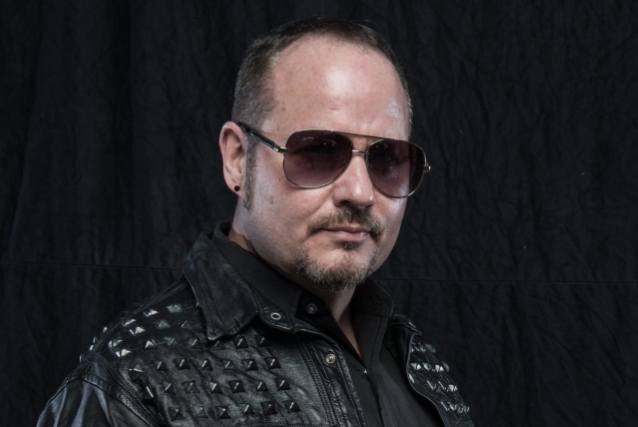 Former JUDAS PRIEST vocalist Tim "Ripper" Owens has dismissed criticism from fans who say he is involved with too many different projects, explaining that he "would be working a 9-to-5 job" if he stuck to one band. While Owens's bread and butter gig is touring the world as a solo artist, he has also loaned his voice and songwriting skills to numerous projects, including SPIRITS OF FIRE, CHARRED WALLS OF THE DAMNED, A NEW REVENGE, DIO DISCIPLES and THE THREE TREMORS. In a recent interview with KNAC.COM, Owens said he approaches every project with the intention of it evolving into a full-fledged band. "Listen, the goal is always to make something and stick with it," he said. "It's funny, because I will have people say to me, 'Well, I don't want to buy that record, because I don't know if it's going to be a band.' Well, maybe if you buy the record first, it might become a band. [Laughs] If people say 'I won't buy it' because of this reason or that reason, then the labels are going to say, 'Never mind.' [Laughs]"
According to Owens, the main reason he is involved with so many different group is a financial one. "There's people that know everything [about] music out there that are always offering me tips on how to run my career," Owens said. "They're, like, 'Tim, you need to be in one band.' Well, if I were in one band, I would be working a 9-to-5 job 50 hours a week to pay my bills. [Laughs] I'm a musician. This is my job. So if I was a fan of music or of George Lynch, Doug Pinnick, I'd want to get all of their stuff. If Rob Halford put out a solo record, a FIGHT record or a JUDAS PRIEST record, I'd be all over those records. Why? Well, because I'm a fan." Tim's latest comments echo those he made in a separate interview with All That Shreds. Asked if he would like to stay in one band instead of having multiple projects, or if he likes the diversity of going from project to project, the singer replied: "I would love to stay in one band. Unfortunately, people wouldn't see me or hear me very often, because I can't afford to tour like that. I'm not 20 and I have a lot of bills, a lot of commitments. My kids, you know... There's just no way to do it. Yeah, it would be great to put out a record, but then it would cost me about $30,000 a year just to put [out] a record, so there's no chance in doing that. This is a really different era." He continued: "Listen, I love it. Here's the thing, if people around the world wanted me to be in one band, then they would buy that record around the world and I wouldn't have to worry about it. But they don't buy enough records to support it anyways. So I can't afford it. "I make my living as a lead singer, as a musician. Young bands start off and they try to be in one band, but they are young bands who start off not having bills and… You know what I mean? I couldn't make a living off of what I made in JUDAS PRIEST back then, so that's just how it is. That's the way the world is now. It's totally different. I have to make a pretty good amount of money to make a living." Adding that he is "busier" now and he makes "a lot more money " than he did while he was in PRIEST, Owens reiterated that his lifestyle requires him to be on the road most of the time. "I'm not saying bad things about JUDAS PRIEST," he said. "They treated me well and paid me well. It's just you get older and you have more commitments and you do more things. I do a lot of things and I made a life that I have to be busy. I didn't make a living on a minimum wage McDonald's salary. If I did that, I'd probably be better off. [Laughs] I should have probably not set the bar so high." Owens also addressed the "cash-grab" accusations leveled at DIO DISCIPLES, with some fans thinking the band is taking advantage of Ronnie James Dio's legacy by going out and performing his classic songs. "The DISCIPLES tour, [that's] not a very big income," he said. "You're going on a tour with a band and you split the money up with the band. That's the least amount of money I make but it’s one of the most enjoyable things that I do. I will put it that way because I I love to go celebrate Ronnie James Dio with those guys. Ronnie's friends and my friends. And the paycheck at the end is not much, but it's satisfying to do and I love doing it. The way I make money is I tour solo around the world with amazing bands around the world, in parts of the world that back me up and my material. I then put records out. But most of it is through touring under my name." Owens, who lives in Akron, Ohio, is also the former co-owner of now-defunct restaurant/live music venue Tim Owens Travelers Tavern (re-branded from Ripper's Rock House on an episode of "Bar Rescue"), which he had to sell in 2016.